Simply put, deviled eggs are hard boiled, cut in half, and filled with — well, that part’s up to you! 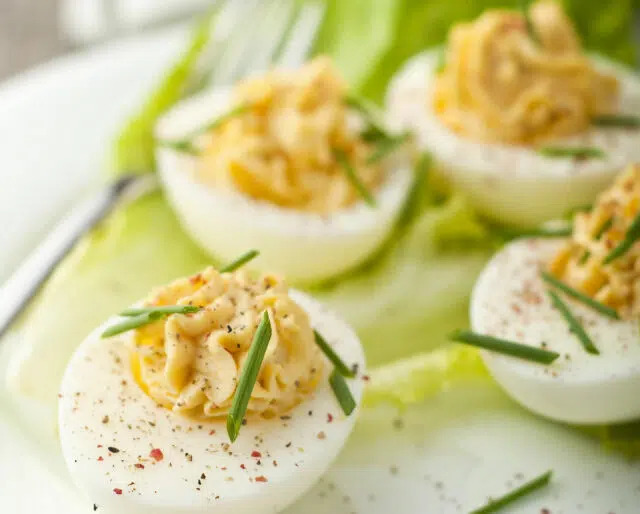 Whether you use mustard or ground mustard, prefer chives or bacon, or hold the paprika or add extra, National Deviled Egg Day is for making and munching on America’s favorite potluck treat. Celebrate on November 2 with your favorite recipe, using trendy ingredients, or buzzing to the grocery store for some easy, pre-made eggs. Mayonnaise is commonly accepted as the binder in deviled eggs. ​This dish is officially dubbed “deviled eggs” because “deviled” foods are seasoned, fried, or boiled. ​A collection of ancient Roman recipes included eggs seasoned with oil, wine, or broth — served with pepper and laser, a now-extinct plant. ​In Petronius’ “Satyricon,” a banquet includes songbirds marinated in peppered egg yolk and stuffed into peasant eggs. The classic deviled egg recipe includes mayo, Dijon mustard, and relish. Regional recipes add different seasonings or ingredients. Chocolate deviled eggs sub the yolky center with a mixture of cream cheese, cocoa powder, powdered sugar, and heavy cream. Top with sprinkles and a pinch of sea salt. For Caesar salad deviled eggs, add olive oil, anchovies, and garlic. Top them with croutons, shredded romaine lettuce, and Parmesan cheese. ​Netherlands, Germany, and France add parsley and tomato to their deviled eggs. ​German deviled eggs might also include cheese, capers, and anchovies. ​Hungarian deviled eggs have yolks mashed with white bread soaked in milk. ​In Sweden, deviled eggs include sour cream and chives, and sometimes caviar and onion, and sometimes pickled herring. ​Paprika is a southern deviled egg addition while the east coast prefers Old Bay seasoning. Deviled eggs are a creamy, tasty addition to any potluck or party. You can even find handy carrying cases so your eggs don’t slide all over the plate. Use mayo or Miracle Whip. Top with dill or olives. Add salami or pepperoni, pork, or crab. If you can think it, you can add it to your deviled eggs. One egg has six grams of protein. Its protein punch is so high, it’s a standard other foods are measured against.